I don't think I've come across a single Adult Swim game on the iTunes App store that I didn't like. They're all fairly consistently amazing when it comes to gameplay, art, and the quintessential quirky/weird personality that is so in tune with my own. Velocirapture is another that hits that trifecta. It's a fairly basic action game, set in prehistoric times. 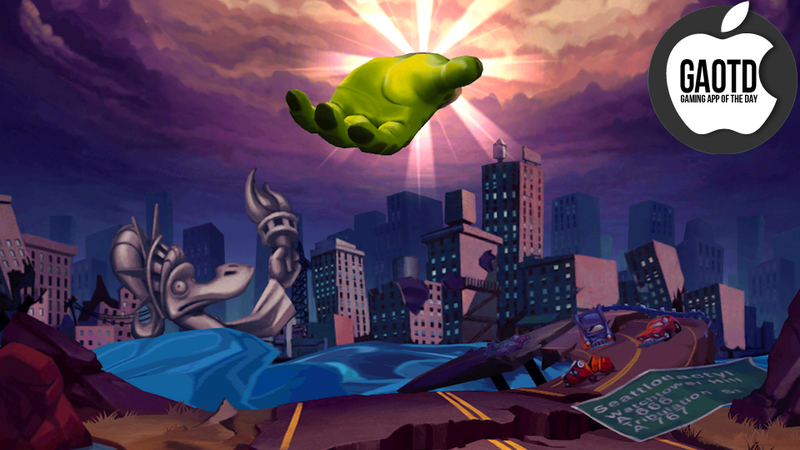 Controlling a green, dinosaur God hand that hovers in the air, you will decide the fate of the red and green dinosaurs (who are, oddly enough, dressed up in human clothes). Smite the red fiends with lightning by swiping down towards them, and gather chain attacks for more glory points. But be mindful you don't accidentally flick the red dinos up to rapture when you aim to send the green ones there. It's fast-paced and fun, but simple enough to hold your attention long enough to see you to the end of your train ride. Things pick up even more when you encounter new dinosaurs, like velociraptors. Green ones are bonuses; red ones will drag your green dinosaurs down to their deaths. There are several other dino species that act just as antagonistically. If you're a fan of endless rapture, also known as horde mode, you can swipe and smite to your heart's desire. Or you can pursue story mode to unlock new cities in which to do your Godly duties, as well as unlock new super smite abilities. Once you gain access to these high-damage smiting powers, electrocuting red dinos will let you collect their souls, filling up a power bar. You can bring down justice with a super smite that acts something like an area of effect spell, smiting all red dinos in the area. Or you can turn your sinful dino children into stone to crack them on tap. Pretty nifty. Maybe it's just because my hand-eye coordination is perfect for these kinds of fast-paced, swiping extravaganzas, but shifting focus between either end of my iPad on the hunt for red dinos is incredibly addictive.